Give your students a thanksgiving themed activity, even in high school! 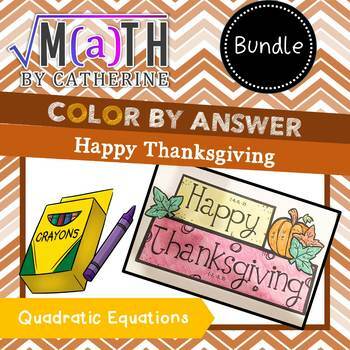 This bundle includes two different worksheets on quadratic equations. Rather than buying just one product you will get both and be able to give differentiate within your class. The difficult worksheet contains 9 questions which are mixed: some are factorable, some you can extract the square, and others need to be solved using either completing the square of the quadratic formula. The easy worksheet contains 7 questions all of which are factorable. Each answer corresponds to a color. They locate the answer on the thanksgiving coloring page and color that part according to the worksheet. There are two different sets for each level of difficulty. They have the same examples on the worksheet, but different colors for the picture to provide variety around your classroom when you hang them up. 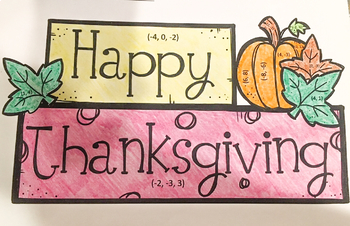 Try these other Thanksgiving Color by Answer Activities as well! Check out these Holiday & Winter activities as well! Don't see the topic or unit you are looking for? Contact me at mathbycatherine@gmail.com or visit my Facebook Page and I can create the topic you are looking for.